It appears that we have had another rant on the comments on this blog. As there are some very serious and wild accusations made we consulted the statistics for the site and it shows, as we thought, that the comments came from the usual suspect. You will notice that the location states South Melbourne. This is the location of the ISP itself and not the person who left the visit trace. It's very interesting, Jon, that you state that the writer won't leave his or her name when you don't do the same thing yourself. It's odd how you can't see the irony in that. You obviously have much too much time on your hands. Now toddle off and take your medication. There's a good chap. This time it's signed by Caroline Allen. Can they actually make up their minds as to who needs to sign what? What sheer and utter madness and downright badness on the part of Caroline Allen and her cohorts. They have grabbed the keys and locked out a whole host of members and claim the church as their own. There is no accountability and the money is now free to do whatever it wants as no one is watching over them as whoever was watching over them and the money has been locked out of the church, and that's the holy truth of it? What they don't seem to realise is that once Norm's membership was accepted then he cannot be removed unless a process has been followed and it hasn't, so the Reverend Power remains a member of the church whether they like it or not. Check with the Department of Fair Trading and you'll see. And they call themselves a church! 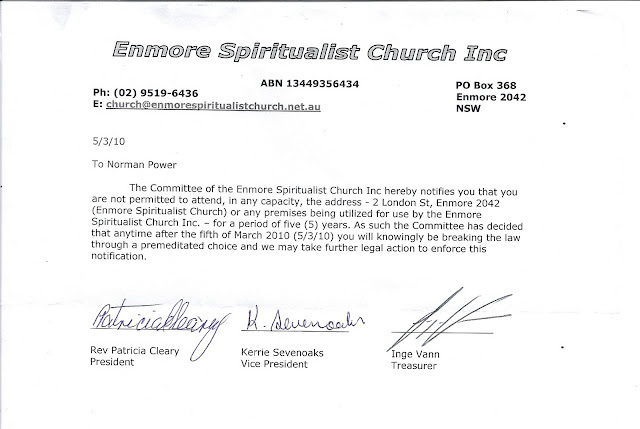 Well, last week, Norm Power received a letter from Pat telling him that he was barred from the church. See below. Now what do you make of that then? First of all he's told that he's barred for five years (which is illegal to tell him anyway) and then he's welcomed back in to the fold again with open arms. This is from the woman who took a vexatious Supreme Court case against five people, Norm being one of them. How utterly strange! What I'd like to know is who typed up these letters. So it seems that Pat and her cronies are up to their old tricks once more. It appears that a number of church members have received a letter telling them that they are barred from the church premises for five years and it's purporting to be an official and legal document. Well, Pat, no Court Order, no legality. And what exactly was the crime of the people now 'barred'. Well, they simply asked questions on the finances of the church. Not a big crime now really, is it! What Pat Cleary and her cohorts don't seem to realise is that they themselves are breaking the rules as they are effectively trying to exclude and expel members of the church, and it just cannot be done without the due process being followed. When will Pat and her friends learn to live within the rules? 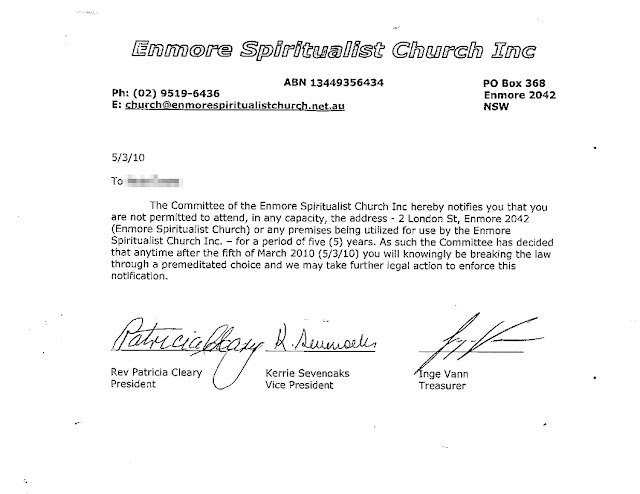 Also from looking at the letter it states that Inge Nichole Vann is now the treasurer of Enmore Spiritualist Church. 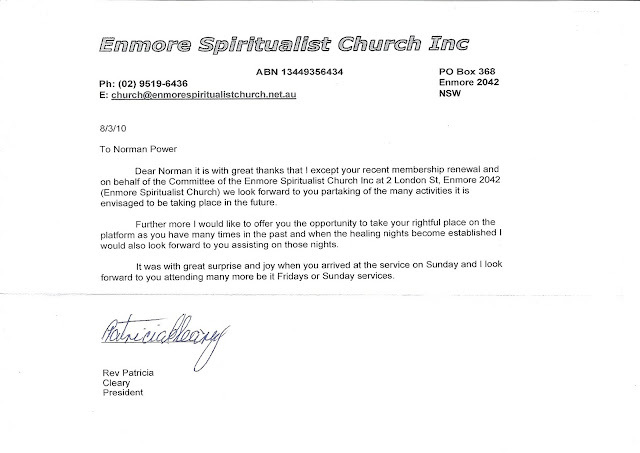 Now how could that happen without a general meeting having taken place and also how can that be when Inge Nichole Vann isn't even a member of Enmore Spiritualist Church? There was supposed to be an Annual General Meeting on the 4th February 2010 as per Jon Lindsay's favourite quoted document, the Judgment/Order, but Pat decided of course that that wasn't going to happen and was just quite content to utter threats through the front security gate while telling Wendy that she was going to sue her and take her house from her. This seems to be a favourite topic of Pat and her friends as Jon Lindsay also left a voicemail on Wendy's phone telling her that Pat was going to take her house. Click here to listen to Jon's message on Wendy's phone. And here we have an excerpt of an E-mail that Jon Lindsay sent to Chorel Terelinck on the 7th July 2009 after she raised issues with the finances. "Pat's solicitors have done property searches and found you own an unencumbered property. 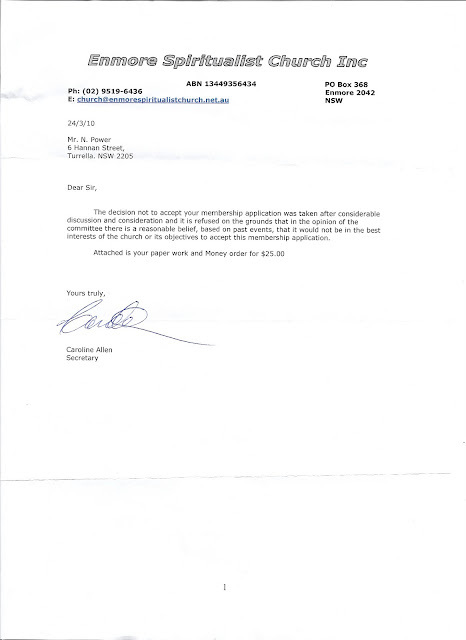 They will be taking an injunction out on your property to ensure you cannot dispose of it until the dispute is settled. They haven't yet found how much Symn's mortgage is-it may be he's not worth pursuing. Your best defense would be to try and settle this matter with Pat direct and to approach the bank and ensure that the insurance is paid. The more you to mitigate the damage the better it will look for you." It seems that both Pat and Jon together seem to like threatening to take people's houses off them. It might well be noted to everyone that Nola was one of the 'expelled' members. Pat tried to expel Nola because apparently there was $20 missing from her class money, when in fact the money was not the church's and was Tess Anderson's and Tess decided to buy lottery tickets with her own money. Now, that's rich coming from a woman who can't find receipts for over $45,000. I also see that it says that Kerrie Sevenoaks is now the vice president of the church. Again, when did this take place? There was no meeting to vote in a committee because they locked themselves into the church and wouldn't let the members in. And they call themselves a church! While we're talking about expulsions we can also talk about the list of members Pat Cleary included in the affidavit she swore for the Supreme Court case, whereby she removed 28 members from the correct list and in their place put the people she wanted. There's proof of this everywhere. And why did she remove 28 people? Have a guess! Yes, you've got it. They asked questions about the finances.